I’ve said this for years, but I will say it again… Oakland has some of the best fans in baseball. And why wouldn’t they? Billy Beane has built a winning team from chump change and always gives the fans a competing team. But it also takes personality to become great fans. For instance, take Ian Sagabaen… aka Greatest Sign Maker. He’s a graphic designer and diehard A’s fan. And for the past several seasons, he’s been creating some of the greatest signs anyone will ever see at a game. In fact, he’s so talented that he’s been featured several times on MLB and even had a behind the scenes look at his awesome sign making. But it takes more than just fans like Ian to create a fan base. You need players with personality as well. Take Coco Crisp. He’s always had personality… just look at that ‘fro of hair. But what he started in Oakland turned into a crazed ritual. After a big play the Oakland players started to do the Bernie lean from weekend at Bernie’s, and the fans latched onto it and ran. It got so popular that not only did they make an official music video (what defines ‘official’ music video anyways? 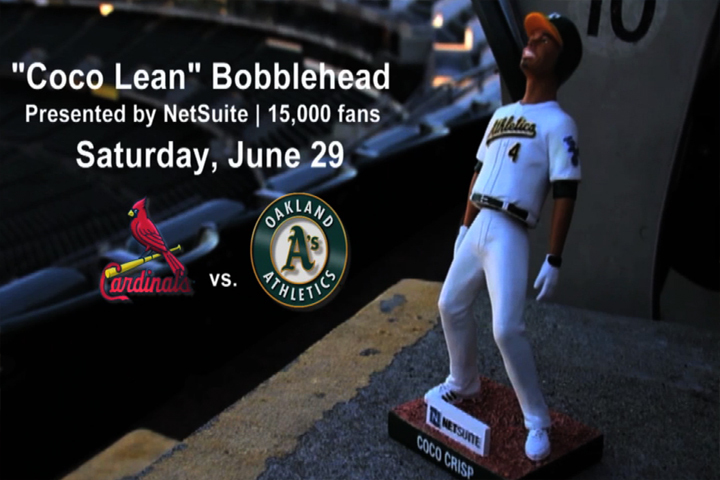 ), but eventually they made a Coco Crisp Bernie Lean bobblehead. But it’s a new season so the A’s need a new character. Cue Josh Reddick, his slump, and his walk-up music. He’s so red hot the last week that he is now 6-for-15 with 3 home runs and 9 rbi’s since adopting the sweet tune.